We all feel the same way when another high-ride gets approved. It’s heartbreaking to see our landscape swallowed up by concrete. BUT it’s not all bad news; some amazing architects have decided to do something about it & the Kyora team are SO on board!! 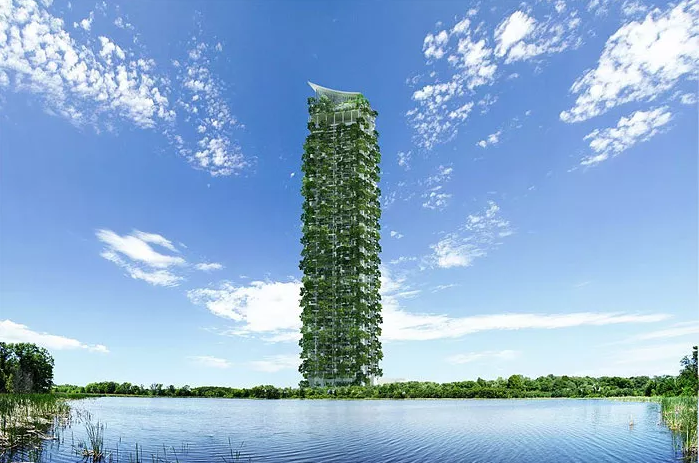 Check out these 3 amazing designs by Architects around the world. Named Bosco Verticale because each tower houses trees between three and six meters which help mitigate smog and produce oxygen. Also used to moderate temperatures in the building in the winter and summer. 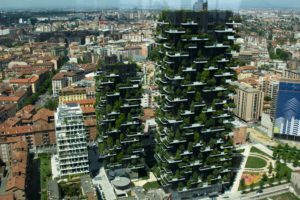 Officially opened in October 2014, Bosco Verticale (Vertical Forest) is a pair of award-winning residential towers in the Porta Nuova district of Milan, Italy designed by Boeri Studio (Stefano Boeri, Gianandrea Barreca and Giovanni La Varra). Don’t want to travel all the way to Milan or Columbia? 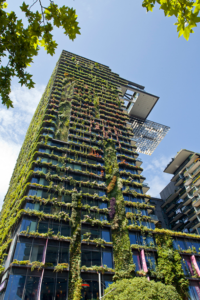 Fair enough… While you’re checking out Central Park in Sydney follow this link to see all of the Sydney green walls & green buildings we know of, that should keep you busy until next time! If you want the most amazing fragrance throughout your garden through July/August, Michelia alba is for you. A medium sized tree growing to a maximum 10 metres in height! 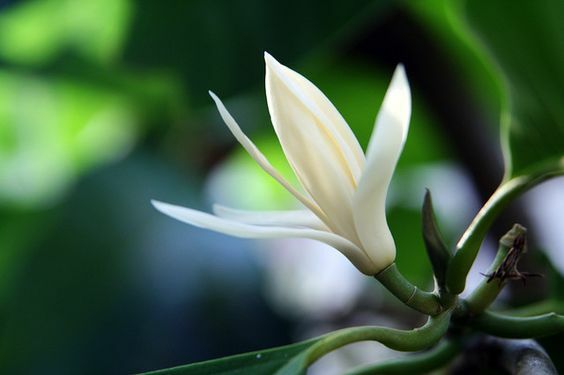 The White champaca has glossy lime green leaves and reasonably discreet, creamy white flowers. 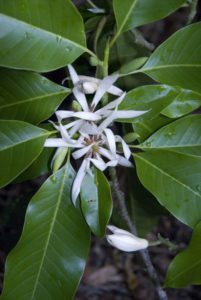 Michelia alba thrives in a subtropical climate meaning keeping the soil moist and well drained will ensure the success of this plant. Keep an eye out for these fragrant beauties, once you have seen one and noticed the fragrance, we bet you smell the next one you find before you see it!! Having met with the client and provided our thoughts, vision & recommendations we proceeded to quote the proposed works and we were swiftly awarded the project. The initial part of the project is the demolition and removal of waste materials. This always has high impact as a large amount of change can occur in a very short time. With no room for a skip bin our next best option; Removal by bulka bag. The bulka bags hold 1 cubic meter of materials. 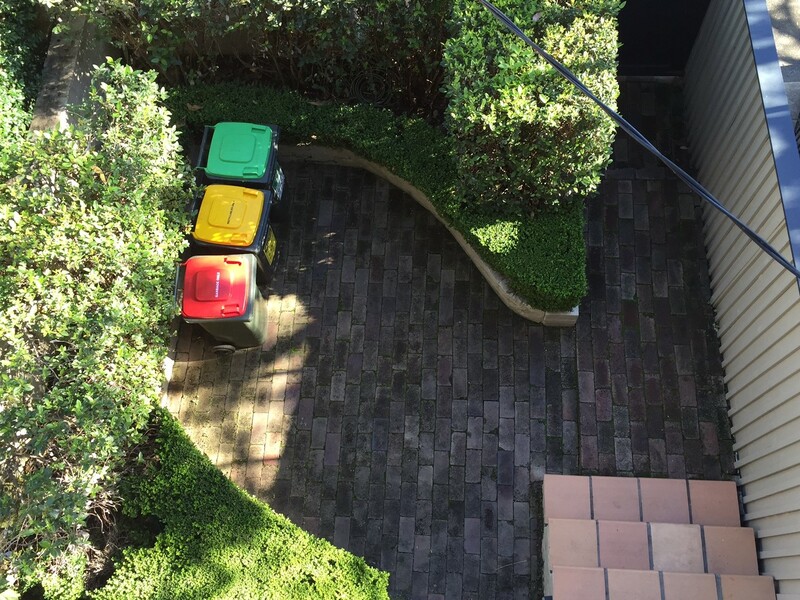 This way we divided materials into mixed waste bags (sand, soil, roots and stumps and any general rubbish that is dug up) recyclable materials (bricks,tiles and concrete) and vegetation. They also supply a pick up service when the bags ready for disposal. Rather than throwing away the bricks, knowing we needed to construct a new brick wall we decided to keep all to re-use them. Once all demolition material was removed we were able to set out the locations of the new walls, new entrance path and bench seat. From this setout we could also confirm the plan to provide the garden with adequate drainage. 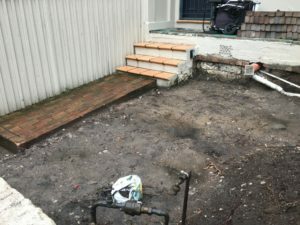 An existing storm water pipe was located and we could connect a new drainage pit for the artificial turf area to this. Footings poured, walls constructed, walls rendered, tessellated tiles installed. The job was taking shape and with limited room to move, the project had been coordinated so there weren’t too many people on site. With the bench seat install also came the artificial turf. The garden was coming together with countless passers by all astonished by what we were achieving in such a small area. Soil and plants soon followed and the garden sprung to life. It’s amazing what a few plants can do to transform a work site into a garden. 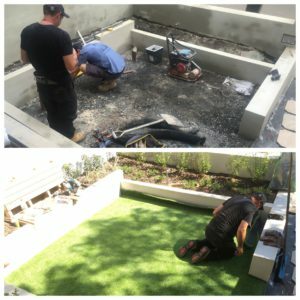 Enjoy the photos below as the construction site evolves into a nearly completed garden. The completed of this job will be revealed in the next installment…..
Aloe plants provide a surprisingly bright display come winter and you’ll see them out now! 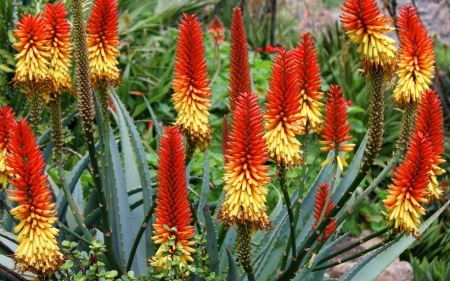 Shooting up spires of most commonly reds, oranges and yellows, the Aloe plant is a hardy plant that can be easily mistaken as a boring succulent. They are indeed far from this! Aloes come in many shapes and sizes. Most commonly found in many gardens and pots across Sydney is the Aloe vera plant. More popular for its healing properties than its flower, it too will send up an interesting display of deep orange. A couple of varieties that produce a great floral display include the Aloe ferox and the Aloe arborescens. 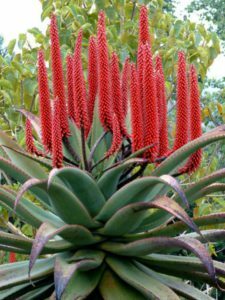 A versatile plant, Aloes can be used in cottage gardens, rockeries, coastal gardens as well as succulent/xeriscape gardens. 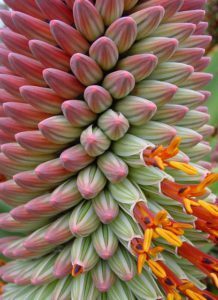 The Aloe tree (Aloe barberae) can be used as a stunning specimen plant. Growing into a tree like habit to a maximum height of as much as 18m!!! Aloes prefer full sun and good drainage. They can grow right on the coast and require limited watering, as little as once a month. Look out for the stunning spires of the Aloe plants as you drive around this winter and look to include some in your garden where you can! 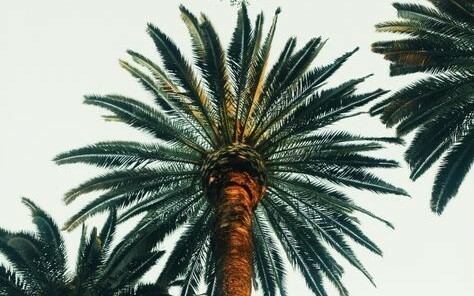 Are you searching for the perfect palm? Although Sydney does not have a tropical climate that is generally associated with palms, they can still thrive all over Sydney. 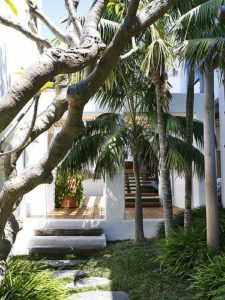 Kyora Landscapes has 5 favourite palms that will grow especially well in the temperate climate of Sydney. Each have different features and uses in a garden and are unique in their own special way. Below are Kyora’s top 5 Palms listed from the largest to the smallest growing. With either a single trunk and commonly multiple trunks, the Bungalow palm is very common around Sydney. It can grow up to 25 metres high so many sure you are aware of this prior to planting!! Bungalow palms are generally quite fast growing. They do require a good amount of water to thrive. Bungalow palms like most palms are reasonably low maintenance, requiring the removal of dead fronds as the naturally peel off the trunk. A good palm if a tall canopy is desired with a clear trunk. Growing to 18m tall, the Kentia palm is a slower growing, single stem palm. Some may look like multi stems but these are other individual plants growing in close proximity to each other. 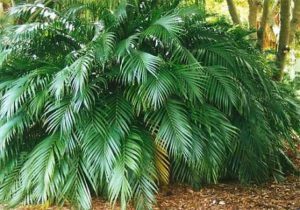 Kentia palms can tolerate low light conditions up to full sun exposure. Kentia’s are also commonly used as indoor plants and are low maintenance. A great palm that won’t get too big too quick, and you’ll have plenty of room around its trunk for underplanting and a medium canopy to protect the understory planting. A clumping palm, the Golden cane palm will send up numerous trunks not just one main trunk like the Bungalow and Kentia. 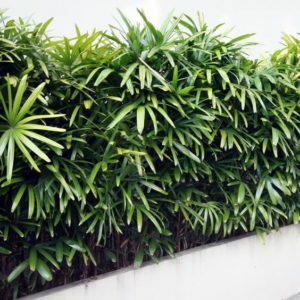 With a maximum height of approximately 12 metres high, the Golden Cane palm is great to achieve a good level of screening. Also low maintenance with the occasional removal of dead leaves. If grown in lower light, the leaves will be more green than gold in colour, but when planted in full sun, the leaves will be a yellow/gold colour. The golden cane can be grown indoor or outdoors. 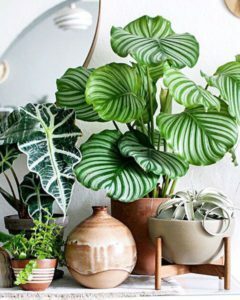 For all you need to know about the benefits of indoor plants read last months blog! Also a clumping palm, the Rhapis palm sends our numerous stems of glossy green, fan like leaves which create a stunning lush screen if required. It grows to approximately 3-4 metres high. The Rhapis palm grows best in part shade conditions as well as indoors. If grown in full sun, the leaves will turn yellow. A low maintenance plant with the occasional brown leaf to remove. Definitely a favourite palm when planted in the right location. The Cascade palm can look like a miniature green version of the Golden cane palm. A great little clumping palm growing no higher than 2 metres high! 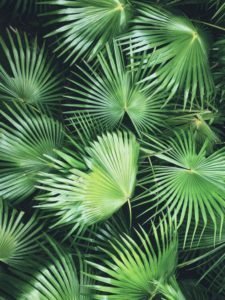 the Cascade palm grows well indoors, in shady areas of the garden and can also tolerate sun if plenty of water is available. A good, low maintenance, compact palm that won’t get too big. So there you have it! If you’re looking to create a tropical feel to your garden, a few palm trees is the place to start. 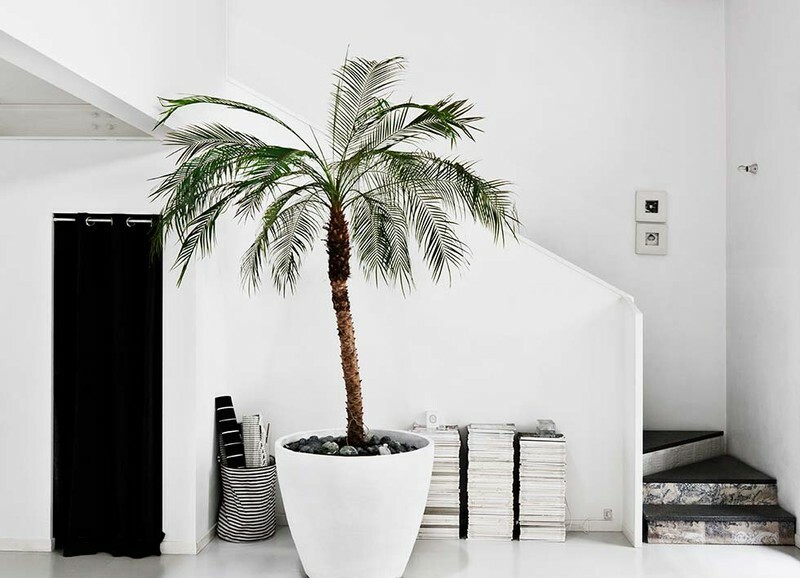 Remember when it comes time to select a palm for your garden, refer to Kyora Landscapes Top 5 Palms that will grow well in Sydney and you can’t go wrong! So you want to design the landscape around your home? Perhaps it’s sat there neglected for some time, perhaps it’s a property you’ve just acquired and moved in to. Perhaps you have the landscaping choices of the past to contend with, perhaps you are starting with a blank slate. A great lawn is a great starting point for an amazing space, but there is so much you can do to make a space more inviting and functional. Either way, let’s look at some of the important questions you should ask yourself before starting a landscaping project. 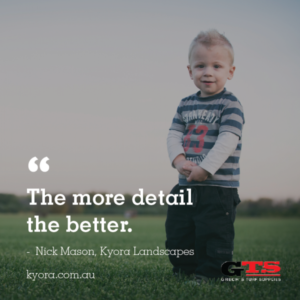 We spoke to Stuart Mercer and Nick Mason from Kyora Landscapes about some of the questions you need to ask yourself before starting a landscaping project. 1. What do you want to from the space? It might seem obvious but understanding the function of the space will help inform the direction and materials for your landscape project. Are you trying to screen out the neighbours to create a private hideaway, or do you want to open up your space to the wider world? 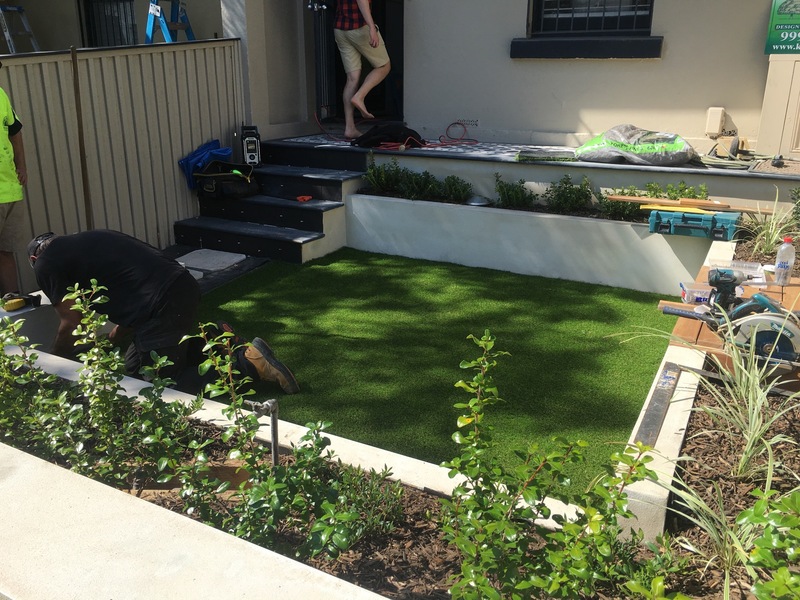 Do you want some soft lawn under your feet to encourage children’s play, sports and create a place for pets to enjoy? How much time, energy and money are you prepared to dedicate to your space? Do you something that is low maintenance or are you happy to make adjustments to the garden on a regular basis? How long do you intend to live in the space? Are you getting the garden ready for a quick makeover ahead of an auction next month, or do you intend to retire and grow old in your garden oasis? 2. What weather conditions does the site experience? Additionally think about the site itself. Do parts of your landscape get more sun than others? Are parts of the landscape shaded by trees or buildings? Does your area have long hot summers, or bitter cold frosts? Obviously these factors will play a large role in plant selection, but they will also inform other aspects of your design. If you enjoy the early morning sun, for example, you will need to make sure you don’t plant or install anything that will block that sunlight. Stuart recommends doing some research in your local area to get a sense of what plants will work well in your space. Talk to your neighbours and friends with gardens, talk to a number of different landscapers, and go to your local nursery for information. Take photographs of plants in your local area. Remember if it grows in your neighbourhood, it will probably grow well in your space too! 3. What do you want to keep from your existing landscape? Assuming you’re not starting from a blank slate, consider the elements that already exist in your space and think about which ones you would like to keep. Is there a particular tree that offers the perfect amount of shade on a summer day, or a piece of furniture that you cherish? Do these things need to stay in their current position or is there some flexibility to rearrange these? Will they act as focal points for the landscape or would you prefer them to blend into their surroundings? There’s no avoiding it – you need to think about the money involved in this project. Do you intend to work with a designer or plan the work yourself? Need labourers, gardeners, specialists? Do you need to buy plants, turf, furniture, other landscaping materials? Will you need to buy or hire special equipment to get the tasks done? Remember that price point isn’t the only consideration, especially if you plan on working with a professional landscaper. Even the most humble landscaping project will take time, and it is important that you work with someone you have a good working relationship with. Has your landscaper considered the challenges and opportunities of your space? Do they have the experience to be able to make recommendations on what will work well in your space, is cost effective and stand the test of time? 5. What is your time frame? When it comes to timeframes do you have a definite deadline —perhaps an open house that the landscaping needs to be finished for— or are you more flexible? How large is your project —will you need to break it up into multiple phases? Do you need an instant makeover or are you happy to let your garden develop more organically over time? If you are designing a space for yourself it has to be incorporate things you like! Take some time to think about what inspires you and how you can incorporate that into your landscape project. Do you have an interest in native plants? Do you have a fondness for cottage gardens? Is there a style of garden that really appeals to you? 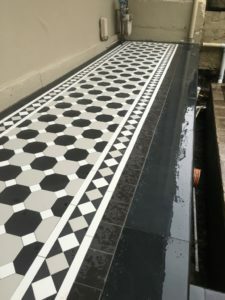 Consider looking online —perhaps on Pinterest— or in magazines for ideas and inspiration, and talk to a qualified landscape gardener to find out how they can help. Not every idea you encounter will work for your or your space, but exploring a number of ideas will give you a broader palette to work with. 7. What challenges and opportunities does the site pose? We have already talked about the climate, sun and rainfall conditions of your site, but what other challenges and opportunities does the site pose? Does access to the site pose any challenges? Can you get heavy machinery onto the site if you require it? How is the drainage of your soil? What is going on beneath your landscape? Remember to always dial before you dig to avoid any issues with underground pipes and cables. 8. Who do you intend to work with? Even if you intend to do all the work yourself, you will still need to deal with suppliers for landscaping supplies and plants. Find out what companies service your local area and the kind of things they can help you with. For larger jobs you may need to hire specialist equipment and experienced professionals to operate it. If you are working with a professional landscaper, it is important to find one that suits both you and your project. It is really important to talk to many landscapers and find one that you really feel comfortable with and who can offer their expertise to help you make the right decisions. Thanks to Stuart Mercer and Nick Mason from Kyora Landscapes for talking the time to talk to us. 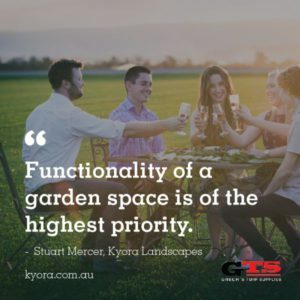 You can learn more about the services Kyora Landscapes offers by visiting their website. GLEBE – JOB PROGRESS – PART 1 ! On arrival to a potential job in Glebe we were greeted by quite a small space and a not very inviting entrance. 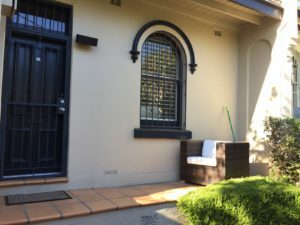 Located in a street of almost entirely terrace houses, front gardens, if you have one, are small and usually never used. 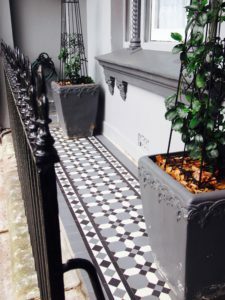 The brief for this job was to design and construct a usable area while also creating a striking entrance to the property. The existing layout did not maximise the area available. With curved walls a paved entirely with common bricks with no drainage meaning all the bricks were mossy and slippery. 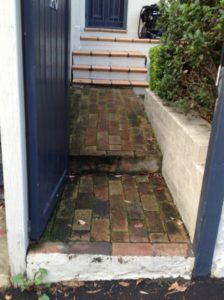 The terracotta tiles covered uneven steps as well as a sunken saggy patio. 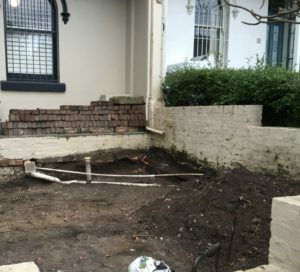 The garden looked in need of an urgent upgrade and we were excited by the possibilities. Through the design phase, artificial turf was proposed as the client had young children in need of a play area. The idea of mowing such a small lawn area is never very appealing. With a new area for play, we proposed a small bench seat as part of raised gardens around the perimeter of the garden. 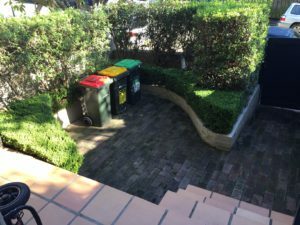 The raised gardens were to be shallow enough to not take up too much of the precious space but deep enough for some privacy planting especially along the front boundary. To create an impact on arrival, tessellated tiles were a preference. This would not only suit the building and area but create a stunning entrance to the property. Check out the before photos and we look forward to presenting how the job evolved over the coming weeks. 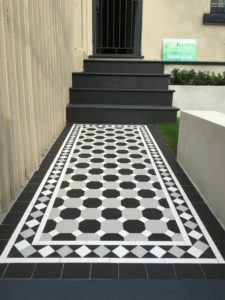 Example of proposed tessellated tiles for entrance path and patio. 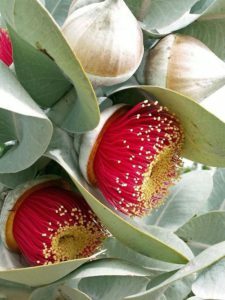 The Eucalyptus macrocarpa from Western Australia, very much valued for its huge dark pinky red flowers and grey-green foliage. This beautiful tree reaches 2-4 metres in height with a width of 2-3 metres, making these giant gum nuts all the more spectacular when they burst open displaying their vibrant colour. 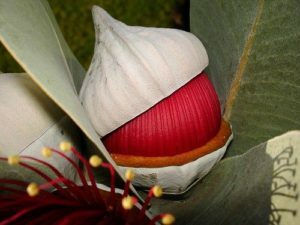 Do not be fooled by the photographs, these gum nuts measure about 3 inches (75mm) across with the largest of all the Eucalypt flowers. They can grow up to 10cms in diameter. The Eucalyptus macrocarpa is an extremely low maintenance plant. Blooming in spring to summer, mostly red or pink-red. Best grown in Mediterranean climates with dry summer weather, and have proved shorter lived in more subtropical climates. 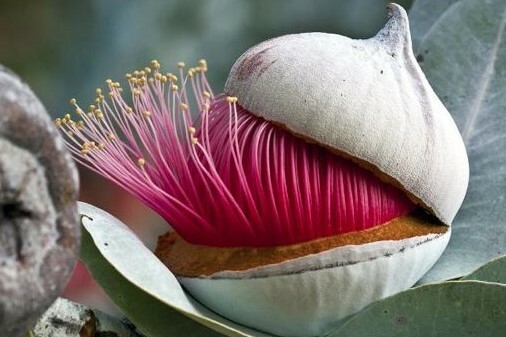 Eucalyptus macrocarpa- Bees, nectar eating birds, butterflies & insects! Indoor plants are IN right now. I have filled my house so full of plants you could mistake it for a rainforest & I’m still trying to find room for more! But, let’s not get carried away with the “trend”. There is a real reason why indoor plants are back & back to stay this time. When you breathe, your body takes in oxygen and releases carbon dioxide. During photosynthesis, plants absorb carbon dioxide and release oxygen. Making plants and people natural partners. Adding plants to interior spaces can increase oxygen levels. At night, photosynthesis ceases, and plants respire like humans, absorbing oxygen and releasing carbon dioxide. A few plants – orchids, succulents and epiphytic bromeliads – do just the opposite, taking in carbon dioxide and releasing oxygen. Place these plants in bedrooms to refresh air during the night. We could all do with a little more focus in our lives from time to time Studies at The Royal College of Agriculture in Circencester, England, found that students demonstrate 70 percent greater attentiveness when they’re taught in rooms containing plants! In the same study, attendance was also higher for lectures given in classrooms with plants. Use fragrant plants such as dwarf kaffir lime trees to fill your home with a wonderful fresh smell instead of using artificial air fresheners. It’s a natural and chemical-free way to freshen your home, not to mention being handy for cooking! Bringing flowers or a plant while visiting a hospital patient may be verging on cliché, but so effective are plants in helping surgery patients recover that one study recommends them as a “non-invasive, inexpensive, and effective complementary medicine for surgical patients.” Plants as medicine! Plants have long been used to reduce noise from busy roads. More recently, research has shown another benefit: interior plants can help to reduce background noise levels inside buildings, too. 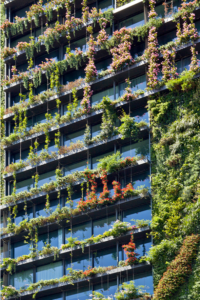 Our own studies indicate that plants and their leaves absorb, diffract or reflect background noise, thereby making the environment more comfortable for the occupants. We love designing and planting Tropical gardens. They always have an abundance of colour and lushness that brings feelings of summer and warmth. 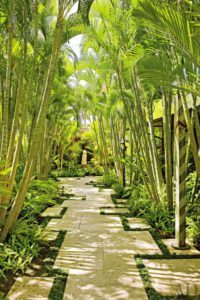 Below are Kyora’s Top 5 plants to achieve a tropical garden paradise. 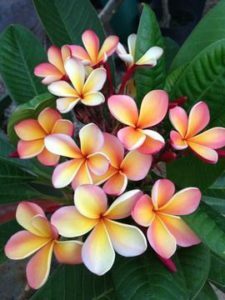 A favourite amongst most people, the Frangipani can create a tropical feel in your garden instantly. Frangipanis are loved by all, not only for their unmistakable appearance their incredible perfume. The large green leaves appear in abundance and as the plant ages, its trunk will create a gnarled feature in your garden. 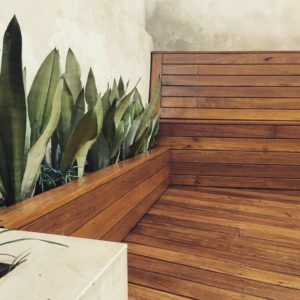 Fan palms, Rhapis palms, Kentia palms, Bungalow palms are just a few to mention that all grow well in Sydney and can bring you one step closer to a tropical garden paradise. Palms can be used for their large leaves like the fan palm, or can be used to create a canopy like the Kentia and Bagalow palms or even screening using the Rhapis palms. As a feature specimen, the Giant bromeliad is a personal favourite. 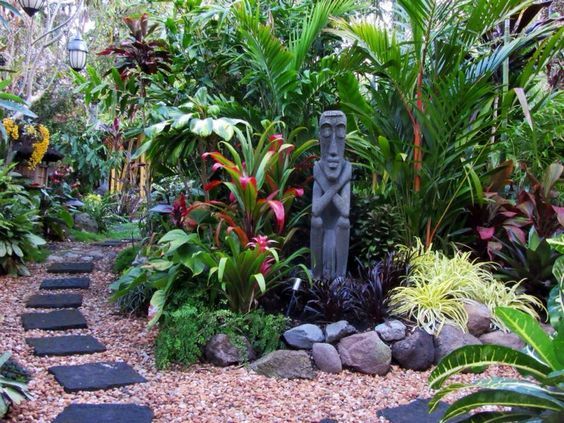 Its unique size and shape can create a stunning tropical accent to any garden. 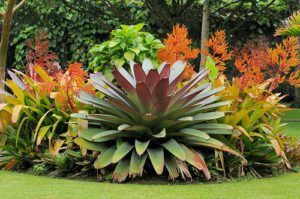 Best planted in groups, there are literally hundreds of types of Bromeliads to choose from! 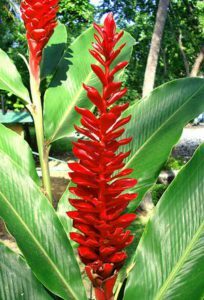 Ginger is a popular choice for its bold colours of foliage and flowers. 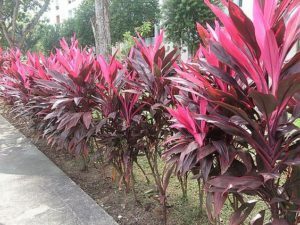 Alpinia zerumbet, nutans, purpurata are just a few of the many varieties available and will add a touch of the tropics to any garden.